If you’re like me, you have a nice collection of vinyl and you enjoy listening to them on a regular basis. The problem is we live in a go-go world and cannot listen to our favorite records when we’re away from our turntable. Other times, you may have a record that’s extremely rare and has not been released in any other format beyond vinyl. And because of that, you want to find a way to preserve the music for the future. 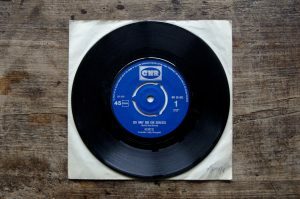 Well, fortunately, there’s a way to convert vinyl records to digital formats. 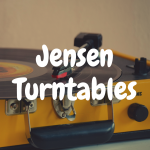 And in this article, I’m going to show you the best vinyl to MP3 turntables available on the market, so that you can become one step closer to transferring some or all of your record collection to MP3 or CD. 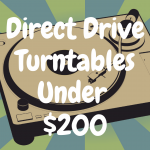 And, to better help you find the right record player for your needs, be sure to check out our interactive table below, which contains some popular turntables capable of converting vinyl to CD or MP3’s. What do you want out of your turntable? The most important thing to keep in mind when purchasing a new turntable is what you wish to achieve. Will you be using your turntable for active listening or just for transferring your records to a digital format? 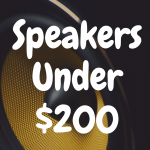 If the highest quality recording is your goal, then there are a number of high-end units available. If you just want a more mobile version of your tracks and recording quality isn’t that important to you, then you can save some money with a more modest device. 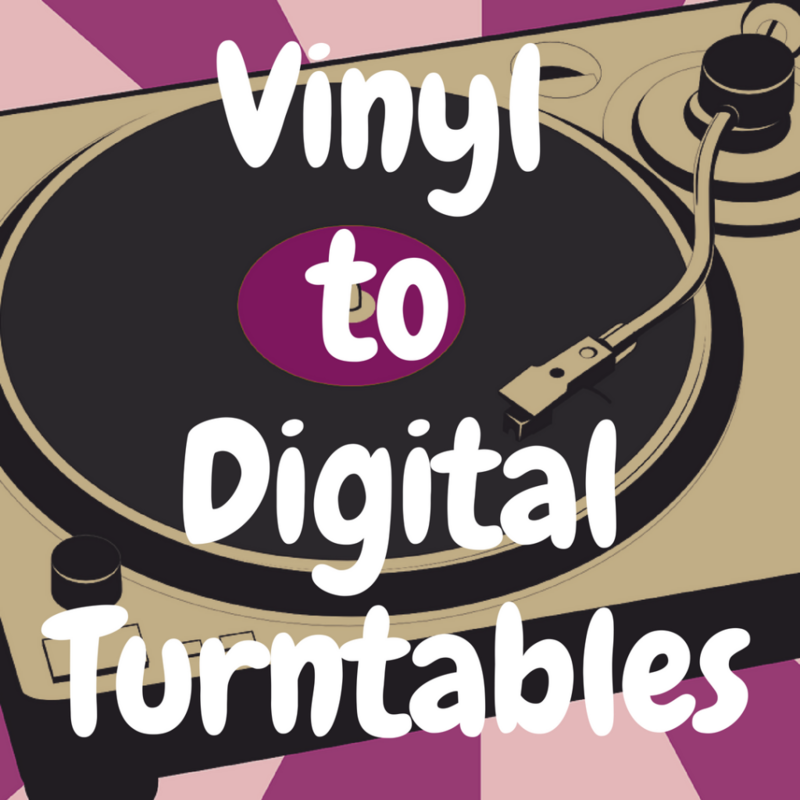 I’ve found five modern record players that can be used for digital transfers of vinyl. I’ll list them all below and then discuss what I like and dislike about them, in order to help you get a better idea of whether or not the record player is a good fit for your needs. I chose the ION Archive LP to show that there are very affordable options available for those looking to transfer their vinyl to digital. The Archive can be had for around $80 and has everything you need to get started transferring including a USB out and EZ Vinyl/Tape Converter software for PC or Mac which is easier to use than Audacity but offers fewer editing options. The Archive will play 33 1/3, 45 and 78 rpm records but you’ll need a different stylus for the 78s (not included). The unit also has built in speakers but the quality has been described as “tinny.” It does have a headphone jack which is not always a given even on higher end turntables. Additionally, the digital tracks sound just OK, not great. A cartridge upgrade wouldn’t be a bad idea but it does a respectable job considering the price. If you’re looking to preserve your vinyl, don’t want to spend a lot of money and the quality of your recordings isn’t that important then the Ion Archive LP may be just what you’re looking for. This is one of the better looking turntables I’ve looked at and priced at around $300, the TEAC TN-300 is a solid option for making digital transfers of your records. It’s a two speed, belt drive unit with both phono out and a USB port on the back so you can connect it to your receiver or PC/ Mac. The TN-300 features fully adjustable tone arm balance, anti-skating controls and a heavy rubber mat on an aluminum platter. It also comes with a replaceable Audio Technica AT95E cartridge, but the AT95E is pretty sweet so there’s no need to replace it right away. Aesthetically, it’s a slick looking machine that’s offered in a variety of colors. It has a built-in, non-switchable phono pre amp which is a plus or negative depending on your personal needs. Overall, the TEAC TN-300 is an affordable, entry level choice. The fact that it’s fully manual and comes with so many adjustment options makes it stand out just a bit from the crowd and gives you a turntable that you can grow with as needed. 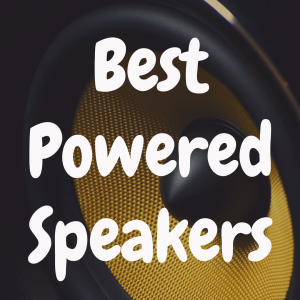 Audio-Technica is a highly respected name when it comes to turntables. Priced at a mere $450, the AT-LP5 produces quality sound at a medium price and, of course, the better sounding your turntable is, the better sounding your transfers will be. 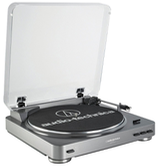 This Audio-Technica turntable is a two-speed (33 1/3 and 45 rpm), direct drive turntable and it comes with a switchable phono/line-out pre-amp that allows it to connect with any component that lacks a dedicated turntable input. It also has a USB port so you can connect it directly into your computer. It ships with a copy of the Audacity digital transfer software which is an open-source program available for free online but, still, it’s nice to have your own copy. This unit has an adjustable counterweight, anti-skate control and cartridge so it’s not exactly plug-and-play but Audio-Technica has a nice tutorial on their website to help you with the set up. If you have a bunch of 78s like me then this may not be our turntable but for the quality and the price, you’ll want to have a look at it. Alright, now while I’m not a big fan of Crosley record players, I do think they have their place depending on what you are looking to do with your records. If you’re a relatively casual vinyl listener, and you definitely want to convert your vinyl to CD, then this is a player that’s at least worth considering. The Crosley Musician is an all-in-one unit with a retro look. 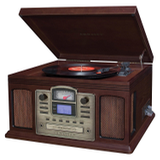 It has a belt-driven turntable that will play 33 1/3, 45 and 78 rpm records as well as cassettes, CDs, MP3 and WAV files. As an added bonus, it comes with an AM/FM tuner and built in speakers. Plus, it has a built in CD burner that supports CD-R/RW discs so you press “record” and it burns your albums and cassettes onto a CD. Want to separate the tracks? Just press “stop” when the song is done and “record” again for the next. All this for just $300. Now for the bad news; the problem with all-in-one systems is when one piece stops working, that’s it. And the parts are not easily replaceable. Sure, you can still use it but it’s incomplete. The other issue is quality or lack thereof. This is not a high-end turntable. It plays records and will record them for you but you will not get the dynamic sound range found in more high end machines. That being said, if you want to avoid hooking up cables, installing software and editing, this very well could be right up your alley. This may be my personal favorite. The Sony PSHX500 is a belt-driven turntable, has both RCA and USB ports and a switchable phono to line output. It’s only a two speed unit (33 1/3 and 45 rpm) with a fully insulated, MDF cabinet. Sony includes some proprietary recording and editing software in the deal to make the transferring process more streamlined and provide you with editing options. One of the qualities that makes this turntable stand out is the A/D Converter contained within. If you’re not familiar, an A/D Converter (Analog to Digital) refers to the chip contained in every digital audio device that converts an analog signal to digital code. They range in quality from very basic to extremely sensitive. Basically, the more detailed the converted information is, the better the quality of your transfer. The PSHX500 has an excellent built-in A/D Converter resulting in very clear recordings. At around $500, this is a great option for the vinyl collector who wants to use a turntable not just for digital transfers but to actually listen to his records at the best possible analog playback. Here’s one additional turntable that I think is another solid option if your goal is transferring vinyl music to a digital format. I chose this Denon machine as an Honorable Mention because its method of USB transfer is completely different from the above turntables. It’s not necessarily better and it’s not necessarily worse. 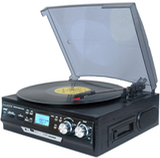 The DP-200USB is a fully automatic, two speed, belt-driven USB turntable with a built in USB encoder. This unit is suitable for listening through your hi-fi and it has a face mounted USB port. The built-in encoder allows you to insert a flash drive and digitize your tracks directly without the need of a computer nearby. Unfortunately, that is the only way to digitize your records; transfer to the flash drive then insert the flash drive into your computer for editing with the supplied Trans Music Manager (which is for PCs only). You cannot connect the DP-200USB directly into your computer. When it comes to the TMM software, it has a silence sensor which automatically separates your tracks (or you can do it manually) and uses Audio Waveform Recognition to check the first 15 seconds of each track and search its built-in database for artist name, song title, etc., so that could save you some time entering meta-data. The turntable lacks a tone arm lever so you’ll have to manually place the stylus on the record when recording a middle track but at around $250 it’s still an affordable and easy to use option for your digitizing needs. It’s always important to remember that, before you buy your turntable, you need to acknowledge why you want it in the first place. If the number one reason you want a turntable is to be able to convert your vinyl to digital formats, then you have a lot of relatively low cost options available at your disposal. If your goal, however, is to have a great turntable that just so happens to convert vinyl to CD (i.e., a feature you might use somewhere down the line but isn’t all that important right now), then I’d seriously consider buying a record player with the USB/conversion option, and instead, just find the best quality record player you can get. Does converting records to digital matter most to me, or does getting the absolute best quality record player matter more? Either way, you’ll be able to find a turntable that will make you happy. You just need to know exactly what you want and why.